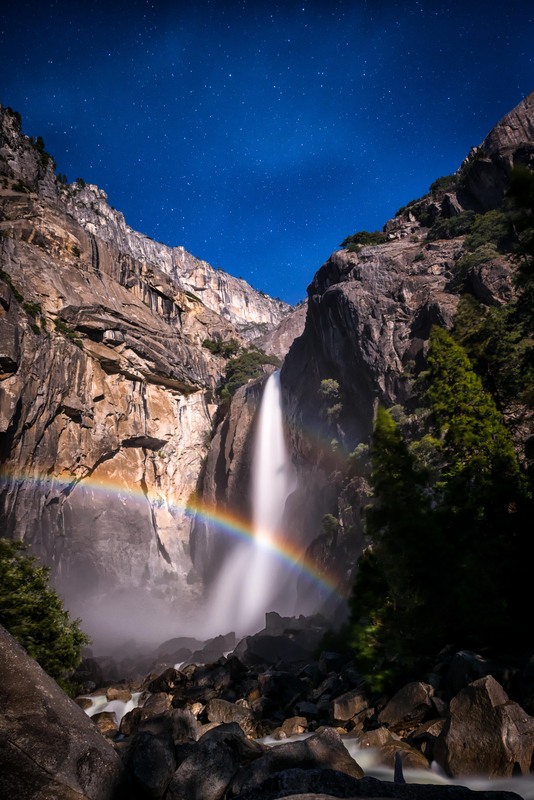 Yosemite Falls Moonbow is a rainbow created by the moon rather than the sun. It only happens a few time a year requiring the alignment of a nearly full moon which is at an angle of 42 degrees (the same condition that is required for a rainbow). 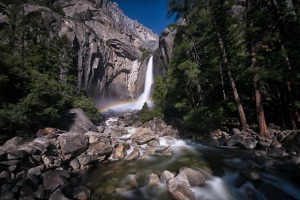 You can not see it with the naked eye but with a long exposure photograph it is awesome! To the eye it looks like a silver shimmer. Below are two photos I took in on April 15, 2014 between 9pm and 10:30pm. I start with ISO 800, exposure time 20 sec, and apperature at f2.8. Experiment and shoot at different ISOs. As long as you are not moving the tripod, you can even drop down to a low ISO and shoot a long exposure to use as a foreground image with digital blending. You have to take an exposure and look at it on the camera screen to see the Moonbow. The Moonbow moves with the mist from the falls so take a lot of exposures. It also seems to start high and move lower as the moon moves behind you over the hour or so of shooting. One of the most surprising things for me was to see that most of the photos looked like they were taken during the day. The only real give away was the sky full of starts! After shooting the Moonbow, go down into the valley floor and take the same photos you would take during the day. You will be surprised at the results. If wind is blowing, pay attention that things do not get blown away. Use a light that only goes red to keep from accidently turning it on white. Consider modifying head light to prevent it going white. Practice setting up your camera before you go. Do it in a very dark room. Set up the basic items on your camera before you go out in the dark. Use a cable release and if you camera has a “mirror up” function use it. Go to the shooting location during the day to get the feel of things. Take a few day photos to find the best lens setup for your gear. I only used one lens for the shoot. Changing lens in the dark can have bad consequences. If you can, bring a small chair. The shoot will take a lot of time and sitting down is nice, consider setting your tripod/camera low so you can shoot sitting. Never use a white flashlight. Only use a red light and point it only at your camera. Turn it off when not using it. As it will be a full moon, you will be able to see very well without a light except for possibly camera settings. Cover bright LEDs on your camera with tape so they do not effect others. If possible cover the display on your camera when checking exposure to avoid blinding someone or creating light flair in their photo.